Document control is used to increase the efficiency of a particular organization by controlling the versions of a particular document that are released. This ensures employees all have the right versions of a particular document. ISO standards are a set of international standards that help standardize processes within businesses and also help businesses keep adequate records, according to Intelex. Companies must understand what standards apply to their particular business and use document control measures to ensure these standards are followed. 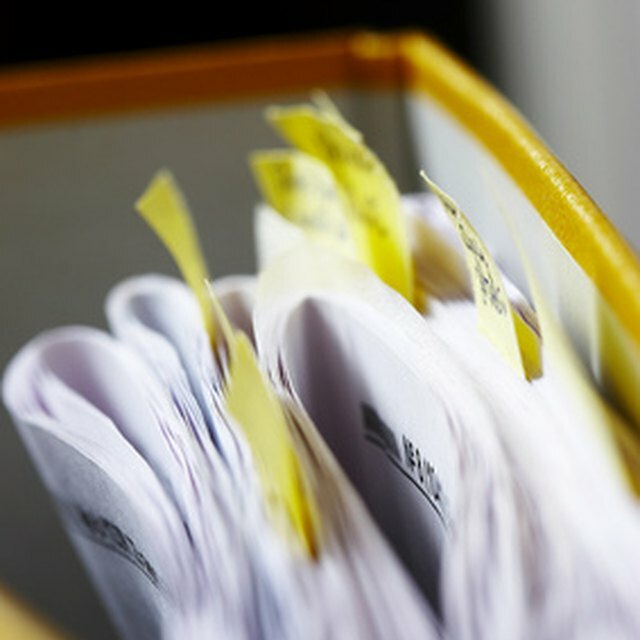 Document control often seeks to reduce or eliminate paper documents so the documents have less impact on the environment and reduce company costs, according to Intelex. Ease of access is also an important aspect when dealing with document control. Companies will have an easier time keeping information up-to-date if they can, for example, easily access that information from the Internet. Documents must be organized into logical categories. By doing so, the appropriate documents for a given situation can be found. These documents are often organized into categories such as policy, procedure, work instruction and forms and records, according to 9000 World. The ISO requires relevant documents be available when needed. Documents must be reviewed extensively before they are finalized. In many cases, these documents should be reviewed by more than one individual, both for oversight purposes and to ensure mistakes are not made by having an extra pair of eyes to catch the mistakes, according to 9000 World. The review cycle should include workers involved in the particular documents and managers who oversee them, since they will have more expertise and will be able to understand mistakes. ISO requires documents be approved for adequacy prior to issue. ISO standards require documents be reviewed and updated whenever necessary. Conditions in a particular company will inevitably change, and updates must be added to the documents when logical. The revision status must be placed on the document, according to 9000 World. These statuses include draft, review and approval. Obsolete documents that are kept by the company for whatever reason must be identified as obsolete. Documents must always be readable and accessible by those who need them, according to 9000 World. ISO requires the documents be updated when they receive wear or damage. Not only should documents that originate from a company be controlled, but the documents originating out of the country should also be controlled, according to 9000 World. Many documents, such as user documents for products and machinery owned by the company, must be clearly marked and distributed to the right individuals in the company.